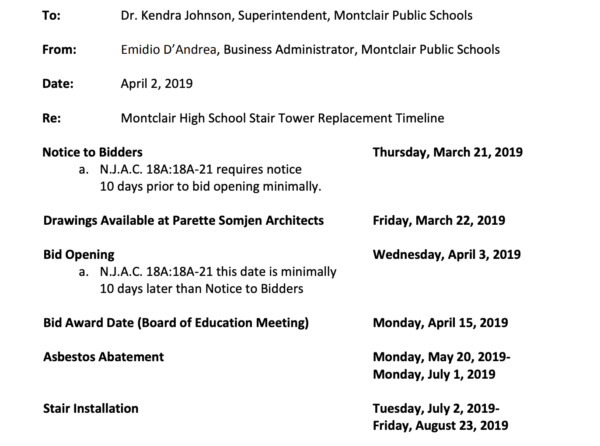 Montclair High School parents and parents of eighth grade students in the district received an email from Montclair Schools Superintendent Kendra Johnson detailing the Stair Tower Timeline for the high school. Montclair High School had a stair collapse in September 2018 and after inspections, other staircases in the Main Building were found to be compromised, necessitating closure and repairs scheduled for this summer. Johnson also notified parents that she will hold a Booster Club Leaders Meeting on Tuesday, April 9, at 6 p.m. in the LGI at Montclair High School. All Booster Club Leaders are invited to attend this meeting. Board policy governing Booster Clubs as well as an open discussion regarding Booster Club efforts will be explored.